Without trying to be redundant, I'm combining pictures and letters from a recent posting along with this most recent letter from John Bork, Jr. All the pieces should help us remember and maybe clarify the evolution of events around 1972 up through 1976 regarding the appearance of Nike on the scene. 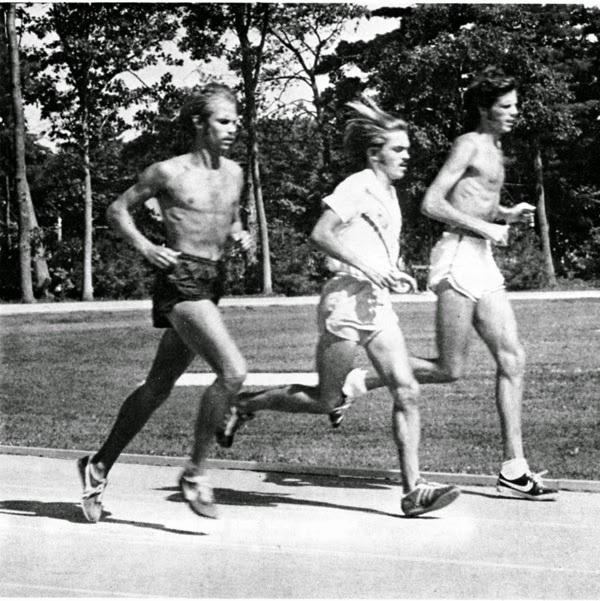 The story came from my putting a picture of Jack Bacheler, Steve Prefontaine, and Jeff Galloway on our site showing the three of them side by side, Prefontaine wearing Adidas, and Bacheler and Galloway wearing some early Nikes. Phil Scott picked up on this and Rick Lower added understanding to the picture and now John Bork has helped with his input. Thanks to all three. Phil, thanks for pointing that out. This is probably around 1972. I think Pre wore Adidas at Munich. on the scene, we'd have to review pictures of these guys from 72 to 76 to try to follow the transition. Probably some pictures would be deceptive as they may have just been 'trying out the new shoes'. Looking at the photo, I’m guessing it might have been taken at the 72’ pre-Olympic camp in Maine. early footwear on the Florida TC guys. situated within the running course. that there was not a single pair of Nikes available to the Olympians at Munich. Shorter had worn Tiger Bostons for training and the Tiger Ohbori for racing. on Onitsuka's Glass-Foot X-Ray pressure plate technology. He was fitted with this shoe during one of his 2 victories at the famous Fukuoka Marathon. 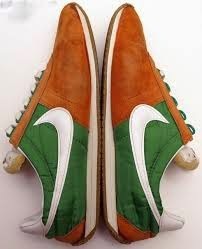 I am not sure that Nike ever copied the Ohbori. However, they did make copies of the Onisuka Tiger Boston, Cortez, and Marathon. continued to produce these three designs side by side. Tiger Ohbori for Frank which he won the marathon in. Before and thereafter Frank wore nothing but Tigers . wore Tiger and then switched to Nike's when he got into the Retail running shoe business himself. 68 Spikes,.Maroon with white stripes. Jack got Dysentary aka: Montezuma's Revenge and could not make the start for the 5K. he was not taking money. Over the years, I was Jack Bacheler's primary supplier for his training and racing shoes thru 1976. Like a lot of runners he was probably not adverse to trying new shoes like the Nikes from time to time. But, throughout his career he wore Tiger's..
problem. The cushioning was adequate for him, as well. blisters on the bottom of their feet. Olympic Trials. When we lost Frank, Mr. Kitami, our Export Director, urged me to engage Frank. allow Frank to drive him home. And, Pre along with Kenny Moore, etc.were Oregon guys. in other ways were not comfortable to Frank. the same manner that was called for in his Nike Agreement. Bill Rogers, Marathon - also wore Tiger racing flats in the Montreal Olympics And before at the Trials. At Montreal we had the following Runners in Tiger Spikes. Duncan McDonald - Stanford - 5,000M finalist. wear Tiger, & making the finals by qualifying in Tiger HJ Shoes. Then he stiffed me and wore Puma's in the Finals, taking money from us both. Kenya and most of the Balck African Nations boycotted the precense of the integrated N. Rhodesian team. By 1980 Jimmy Carter disappointed us all by cancelling the Participation in the Moscow Olympics. World Shoe Survery. John Bork, Jr.
green and orange. We had never ever seen anything like this before. Really a breakout color design. and he was wearing the familiar yellow and blue Tigers. ,never expected anything. If I would have got $ for wearing a mfg. The following article appeared recently in the Dayton Daily News. Days prior to his historic gold medal run in the 1964 Olympics in Tokyo, Bob Schul received a message from the residents of West Milton. Thousands signed a telegram in support of their hometown hero. Fifty years — and one gold medal later — Schul has never forgotten that gesture. For the past seven years Schul has thanked the town in a fitting way: One autograph at a time at the cross country meet in his honor, the Bob Schul Invitational. On a hot and humid Saturday morning, Schul stood for nearly five hours signing shirts, shoes, meet ribbons, medals, trophies and his book for many of the 1,250 runners at one of the biggest meets in Ohio. He’s likely signed more than 5,000 autographs since time commitments eased allowing him to return to the meet in 2008. As Schul posed for a photo with a Versailles boy, he asked how fast the student ran. “Not as fast as you,” he replied, drawing a bigger smile and a laugh from Schul. As he signed a medal for an Oakwood girl, he told her she could sell that autograph for $10 in the United States. He told her take it to Europe and she could sell it for $200. “Wow, really?” she said in disbelief. Schul, who turns 77 on Sept. 28, always did put on a great show at the track. His own cross country career started with West Milton’s inaugural team in 1951. He finished seventh in the state as a senior in 1955, having no idea at the time how far the sport would eventually take him. He was a walk-on with George Rider’s Miami University team but quickly established himself with the school record in the mile as a sophomore (4:12.1). He joined the Air Force in 1959 and trained under Max Truex, who later introduced Schul to legendary Hungarian coach Mihaly Igloi. Igloi’s innovative training techniques helped Schul gain international success with the legendary Los Angeles Track Club, including a 5,000-meter bronze medal at the 1963 Pan American Games. Schul returned to Miami that fall and — despite having to train in a harsh Ohio winter — continued his course for Japan by winning the United States three-mile indoor championship. Both Sports Illustrated and a panel of writers from Track and Field News picked him to win the 5,000 in Tokyo on Oct. 18. He’s the only American runner ever to be the favorite in a distance event. Schul — confident but not cocky from an undefeated 1964 season from one mile to 5,000 meters — knew he would win. With half a lap left he momentarily had his doubts. Australian Ron Clarke fell off the pace, leaving France’s Michel Jazy in front on the bell lap. Schul, waiting patiently in fifth, matched Jazy’s sprint and increased his lead on New Zealand’s Bill Bailley. Schul breezed past fellow American Bill Dellinger and Russia’s Nikolay Dutov on the backstretch. He caught West Germany’s Harold Norpoth in the final turn for second. The only thing between Schul and history was Jazy and a frantic sprint to the finish. Schul, known for his legendary kick, ran down Jazy with 50 meters left to win in 13:48.8. Jazy was also passed by Norpoth (silver) and Dellinger (bronze) in a photo finish at the line. In the athletic entrance at Milton-Union High School is a ceiling to (almost) floor banner celebrating Schul’s accomplishments. A Plexiglas case will soon join it. Schul is donating his Olympic uniform and shoes for display. That’s not the only thing on display at Milton-Union, thanks to Schul. The popular cross country course that starts in a pasture and weaves through the woods and the Bulldogs’ recently refurbished all-weather track can be attributed to Schul as well. Schul’s gold medal dreams didn’t start until he was a sophomore at Miami. Teammates took turns sharing their goals one night. League championships and personal bests were tossed around. Schul was the last to go. As a youngster, even Schul couldn’t have imagined beating the world’s best. He almost died twice as a baby from severe asthma. Growing up on the family farm on Iddings Road didn’t help his condition. Sometimes he would wear his uncle’s World War I gas mask working in the fields. Often, when an attack would happen, Schul would force himself to lay still and keep calm to conserve his oxygen. That mental toughness served him well in his racing. 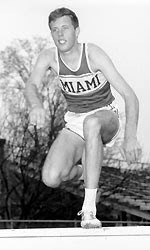 Schul’s international running career came to an end in 1965. Knee pain, other ailments and his asthma left Schul struggling. He made an attempt at the 1968 Olympics in Mexico but an asthma attack limited him to fifth in the trials. Schul started Wright State University’s cross country program in the early 1970s. He taught in the Dayton City School system, coached cross country programs at Brookville, Centerville and Wayne, ran the Bob Schul Racing team and owned a shoe store in Troy. His best advice for runners? To commemorate the 50th anniversary of Bob Schul’s gold medal in the 1964 Tokyo Olympics, Bob Schul will be hosting a party on Saturday, Oct. 18 for family, friends, running teammates, etc. To RSVP, email bobschul@sprintmail.com as soon as possible so a suitable location can be reserved. has sent us a nicely produced video of the Brits Pub pole vault gathering in Minneapolis. competition but since I was unfamiliar with metric heights I can not tell you how high they vaulted. I would guess around 3 meters which is close to 10 feet. Part of our job here at Once Upon a Time in the Vest is keeping you posted on what people who once set records on the track are doing in the present. Here is one of those stories, brought to our attention by Bruce Kritzler. 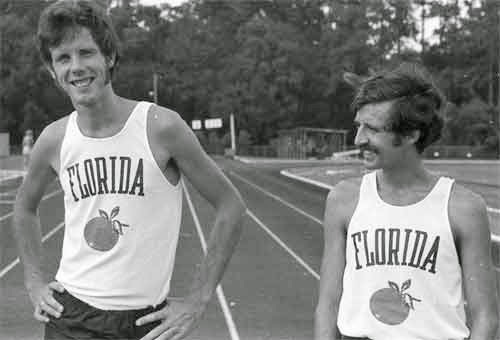 The subject is Jack Bacheler former Miami of Ohio, Florida Track Club and US Olympian (Marathon, 1972, 9th place 2hr 17 min 38.2) . This picture sparked the following question from Phil Scott in Englewood , OH. fit/upper comfort, but lacked cushioning for high mileage. Our product lacked the crafted construction, but had better cushioning. Pre, being more of a middle distance guys was more suited to Adidas product. This article appeared October 23, 2013 on the North Carolina State University website. (Natalie Hampton photo)Entomologist Jack Bacheler raised the State Fair's champion pumpkin, weighing 799.6 lbs. As an Extension entomologist at N.C. State University, Dr. Jack Bacheler helps folks grow crops without giving up too much to insects that feast on plants. This year, Bacheler himself has a gardening success story – he is the proud producer of the State Fair’s biggest pumpkin. Bacheler’s pumpkin, raised in the backyard of his Clayton home, tipped the scales at 799.6 lbs. Since the start of the State Fairon Oct. 17, he has spent a little time in the Exposition Building with the winning pumpkins, telling his story and sharing tips with others. On a recent morning, folks posed for photos and asked Bacheler lots of questions about his pumpkin. For three years, Bacheler tried his hand at growing big pumpkins, but the first two years he didn’t have much success. Groundhogs attacked his pumpkins, so this year he protected the pumpkins with reinforced fencing. Bacheler says there is much information available on the Internet on growing big pumpkins. And though the biggest pumpkin raised in the state was over 1,000 pounds, states like Ohio regularly produce pumpkins in the 1,500-pound range. Bacheler started the pumpkin seeds indoors and transplanted young plants into the garden in May. By late June, the first female flowers were pollinated, and then the real work of raising the pumpkins began. July through September, Bacheler said he spent about an hour and a half every evening tending his pumpkins. “It made it impossible to even go on vacation,” he said. Water and fertilizer are keys to producing a big pumpkin, Bacheler said. He used a drip irrigation system to feed the pumpkins with water, fertilizer and pesticides. Starting with good genetic stock also helps – Bacheler said he paid $40 for two seeds from a parent pumpkin weighing 1,500 pounds. “Pest management is a problem. Insects are my kind of things, so they were easier to deal with. But plant diseases are harder to manage,” he said. The pumpkin was harvested by a small Bobcat that lifted the pumpkin by straps wrapped around it. Once it was raised, it was placed on a pallet so it could be moved by a forklift. Before its debut at the State Fair, Bacheler’s pumpkin was weighed at the Yadkin Valley Pumpkin Festival. Getting it weighed early is important because pumpkins will lose weight as they dry, he said. Bacheler isn’t the first person from the College of Agriculture and Life Sciences to be named a pumpkin king. Wallace Simmons, 4-H agent in Wayne County, is a perennial big pumpkin champion. When he lived in the North Carolina mountains where pumpkins thrive in cooler temperatures, Simmons was a regular winner at the fair. Since moving to eastern North Carolina, he has continued to produce large pumpkins, just not as large as before. What will happen to the great pumpkin? Bacheler isn’t sure. Simmons has sold some in the past, but he retains the seeds which are for sale at the fair for $1 each. Bacheler’s prize pumpkin sits atop the display at in the State Fair’s Expo Building. I like to make pumpkin bread and wonder how many loaves I could get out of Jack's huge pumpkin? Ernie, never being put off by a challenging question, here's what I came up with. A basic recipe calls for a 15 oz can of puree , and that makes 3 loaves of pumpkin bread or 3x 639 equalling 1917 loaves. Knowing you are a child of parents who survived the Great Depression and your mom probably didn't let anything go to waste she would have needed the following to complete the recipe for 1917 loaves of pumpkin bread. So total baking time would be about 265 hours. I'm not going to consider clean up time or rest breaks. adjustments over the years have arrived at a good recipe rather than the usual one found in cook books. Do you like pumpkin bread? Too much causes a lot of gas when I over do it. I like. It stimulates boring conversations with people I sometimes don't care to be around.